Our Annual Gateway Division NMRA Model Railroad Train Show and Model Contest will be held Saturday, November 3, 2018, 9 a.m. to 3 p.m. at Trinity Lutheran Church in West St. Louis County. Children under 12 free (with adult). Bring your model railroading questions – we’ll give you the answers! Bring your models to enter in the contests. Bring your model railroad or prototype train photos to enter in the photo contests. Mini-clinics on the hour and half-hour: scales, track, and scenery. Special hands-on activities for children (big children too!). Special grand prize drawings. Lots of door prizes. Browse the swap tables for that model you’re looking for. Go on self-guided tours of local model railroad layouts. Vote for your favorite models and photos. See small and modular layouts on display. Help yourself to coffee and donuts (for as long as they last), look over what’s being offered at the swap tables, check to see if you’ve won a door prize, take your pride-and-joy model to the contest room, and settle down in one of the clinic rooms and learn something new. A railroad clinic is a presentation on some particular aspect of model railroading or prototype railroading (the real thing). Usually a clinic runs from 45 minutes to an hour long and may allow time for questions. 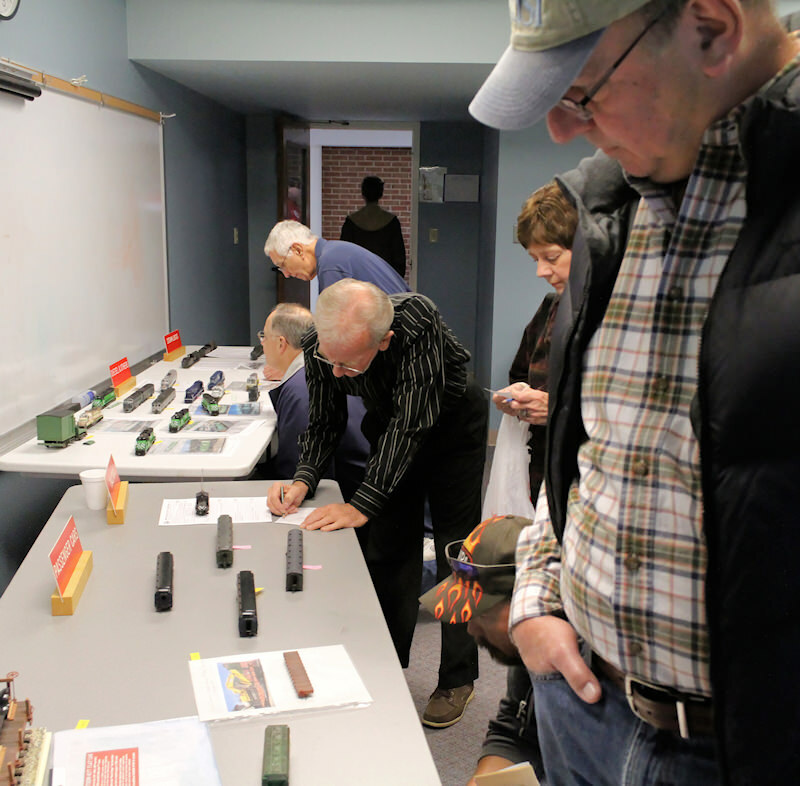 Model railroaders love to share their experience with others through demonstrations, slides, samples, and even hands-on/try-it-yourself presentations. This “how to” aspect is one of the best ways to learn about the many facets of modeling. Clinics on present-day railroads, as well as long-gone and merged railroads, provide background on how the real railroads do things, from operations to laying track and building stations to the kinds of equipment and freight or passenger service to be found. They help the modeler to build and operate a more realistic railroad. 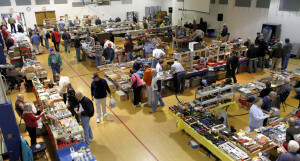 Throughout the Fall Meet, a variety of small and modular model railroads will be on display. 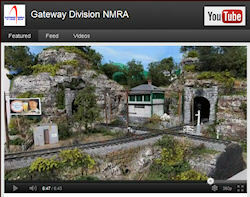 Compare the different sizes of model trains, ask questions, enjoy seeing different approaches to model railroading. Modular layouts combine a number of small elements to create a larger layout. Four members of the Gateway Division will open their homes to tours on Saturday afternoon and evening, beginning around 4 pm. 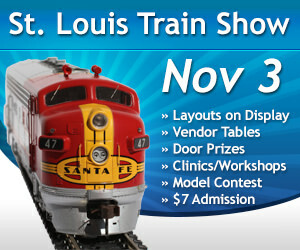 Directions (maps) and information about these layouts will be provided with admission to the Train Show. For more information on this event, contact Hank Kraichely, (636) 394-5151. Flyer for the Gateway NMRA 2017 St. Louis Train Show. Dealers, and those desiring swap tables, please contact Brian Post, (314) 249-6986. Modular layouts please contact Hank. Scales: See a car in each of the popular scales and learn the advantages and disadvantages of each size. Track: There are several different types of track available today. See track examples and learn how each can be used to build your railroad. Scenery: See several approaches to creating realistic scenes on you railroad. Several products will be shown along with different approaches to creating hills and mountains. 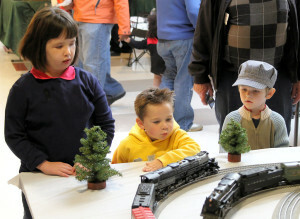 Please check this website to get details on other planned Division model railroad activities and events.